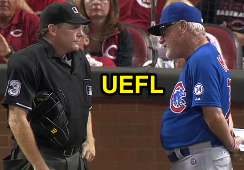 HP Umpire Paul Schrieber ejected Cubs C David Ross for arguing a strike one (check swing) call in the top of the 7th inning of the Cubs-Reds game. With none out and none on, Cubs batter Dexter Fowler attempted to check his swing on a 1-0 splitter from Reds pitcher Burke Badenhop. Play was reviewed and adjudicated by the UEFL Appeals Board (1-7-0), the call was incorrect. At the time of the ejection, the Reds were leading, 5-4. The Reds ultimately won the contest, 5-4. This is Paul Schrieber (43)'s first ejection of 2015. Paul Schrieber now has ? points in the UEFL Standings (2 Previous + 2 MLB + ? Call = ?). Crew Chief Fieldin Culbreth now has ? points in Crew Division (7 Previous + ? Call = ?). This is the 129th ejection of the 2015 MLB Regular Season. This is the 62nd player ejection of 2015. Prior to ejection, Ross had not participated in the contest. This is the Cubs' 4th ejection of 2015, T-3rd in the NL Central (CIN, STL 5; CHC, PIT 4; MIL 3). This is David Ross' first ejection since August 23, 2014 (Vic Carapazza; QOC = Y [Check Swing]). This is Paul Schrieber's first ejection since July 9, 2014 (Don Mattingly; QOC = N [Balls/Strikes]).